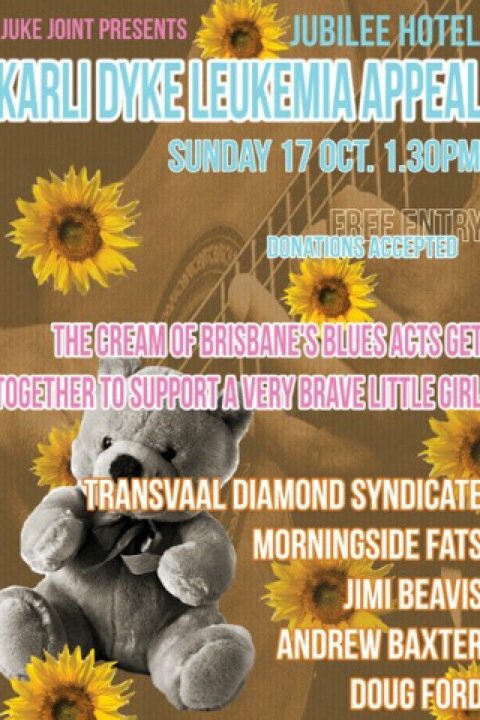 If you’re in Brisbane this Sunday, October 17th, 2010, drop into the Jubilee Hotel anywhere from NOON (correction, not 1:30pm) onwards and support precious Karli by listening to some great bands! These awesome folks are donating their appearance fee. All we have to do is come cheer them on. Entry is free and kids are invited. If you can’t get down there, but would like to buy raffle tickets or make a donation to the Karli Dyke Foundation, message Yours Truly and I’ll find out more details. Watch this space, as Karli and her super-mum Suzie might drop by and do a guest appearance on the blog. UPDATE: Big shout out to Spencer Howson on 612 ABC Breakfast for announcing Karli’s gig! [Friday 15 October 2010].